1. Consider the healthy heart chakra traits in the Balanced Function list and pick one or two that you want to express more of in your chosen relationship. 2. Now stand and make the movement that demonstrates your current ability to express the positive trait(s) you chose. Don’t think, just move intuitively. 3. For comparison purposes later, take note of how you moved, and any thoughts or feelings that occurred along with the movement. 4. 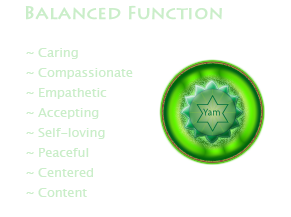 Click on the Heart Chakra symbol to go to the next step.